With Enterprise Connect 2018 quickly approaching, there are plenty of industry developments to keep in the know about as you prepare for the deep dive you'll take at the event. Get your feet wet with a look at five of this week's product announcements. Plantronics announced the latest addition to its Voyager family of enterprise headsets, the Voyager 6200 UC. This headset features a new neckband-wearing style, Bluetooth wireless connectivity, comfort-fit earbuds, active noise cancellation, and, of course, integration with Microsoft Skype for Business and Teams, Cisco Jabber, and other UC applications. The headset is compatible with Plantronics Manager Pro, a management tool offering insight into company-wide Plantronics endpoint use. Hear more from Plantronics on the topic of endpoints at EC18, taking place March 12 to 15 in Orlando, Fla. Peter Jakobsen, business lead for customer engagement at the company, participates in the session, "Phones & Personas: Endpoint Decisions in the Cloud Era," taking place Thursday, March 15, at 8:00 a.m.
SD-WAN provider Talari Networks released a lower-end appliance aimed at enabling businesses to extend SD-WAN services to small branch offices, retail sites, and small office/home office locations. Network managers can deploy the Talari new E50 appliance to production in minutes for connectivity to cloud and enterprise data centers. The SD-WAN services enabled by the E50 provide a particular advantage for UC and video applications, "improving the quality of voice and video by proactively routing packets among the best path to avoid jitter and packet loss, while ensuring bandwidth for every application," Talari said in its press release. SD-WAN will be a hot topic at EC18, with lots of opportunities to learn more about the technology throughout the conference program and on the Expo floor. Verizon Enterprise Solutions launched Virtual Network Services -- Session Border Controller as a Service (SBCaaS), marking an expansion of the company's software-defined networking solution suite. The service, co-developed with Ribbon Communications (formerly Genband and Sonus), is available in pay-as-you-go subscription pricing in the U.S. and other countries where Verizon's hosted network services are available. Enterprises can use Virtual Network Services - SBCaaS on its own or connect it with other virtualized network functions for improved security, quality of service, and regulatory compliance of voice and video communications, Verizon stated in a press release. "Session border controllers are a critical part of an IP-based infrastructure. However, they've traditionally been very capex-heavy and required a lot of skill to deploy and maintain. By virtualizing the SBC and taking those pain points away, Verizon is taking a disruptive approach and offering a compelling alternative to an on-premise, manually configured SBC deployment," said Mike Brandenburg, Frost & Sullivan analyst, in a prepared statement. Dive into SBCs at EC18 in the session, "Trends in Session Border Controllers: Virtualization & Security," taking place Tuesday, March 13, at 8:00 a.m. Managed VoIP services provider Unified Office has extended its year-old Internet of Things (IoT) operational performance service, Total Connect Now, to include management of environmental controls. With the Total Connect Now Operations Performance Suite (TCNOPS), businesses are able to monitor and analyze IoT data collected and sent over the Unified Office VoIP infrastructure. The 2.0 version adds the ability to control environmental devices such as thermostats, air conditioners, refrigeration equipment. The service will take action based on trigger events generated from the IoT data, as well as use predictive intelligence capabilities to suss out and report on potential problems before they can cause harm, Ray Pasquale, founder and CEO, told No Jitter. Unified Office, popular service among Domino's franchisees, has seen uptake of TCNOPS in 80 of these sites, with the service on order at 200 more locations, Pasquale said. IoT data analytics and reporting can be crucial in such heavily regulated quick-serve environments, where falling out of accepted temperature ranges by just a couple of degrees can necessitate restaurants to dispose of food, he said. 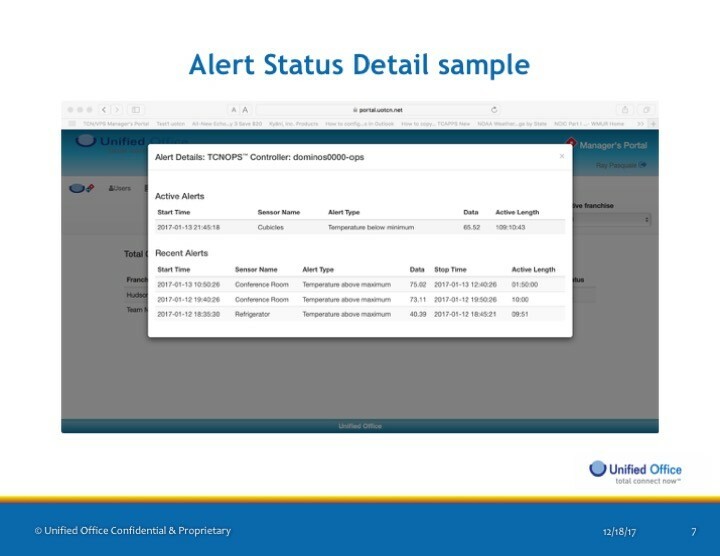 In environments using TCNOPS, sensors report to the Unified Office software for analytics. When environmental conditions nearing pre-determined thresholds, TCNOPS will alert managers by text messaging or other communications mode. "Machines have a lot to communicate, so they deserve the same level of reliable transfer of information as humans receive," Pasquale said. Learn more about IoT at EC18,in the Tuesday afternoon session, "IoT: Market, Players & Opportunities," and the Wednesday afternoon session, "Real-World IoT -- How It Works, How It Integrates." Immersive collaboration vendor, Oblong has enhanced its Mezzanine Series of collaboration solutions with a new feature called "picture on picture," or PoP. When content is shared during a videoconference, this feature automatically sizes and positions the video feed so call participants can also focus on the shared content. Other enhancements include integrations with Microsoft Exchange and Skype for Business and updates to the Mezzanine Screencast application for wireless screen sharing. Screencast now features auto-discovery and point-and-click meetings availability. Beth Schultz, No Jitter Editor, also contributed to the writing of this article.